The cornea represents the strongest part of the refracting power of the eye, providing about 80% of the power of the system. 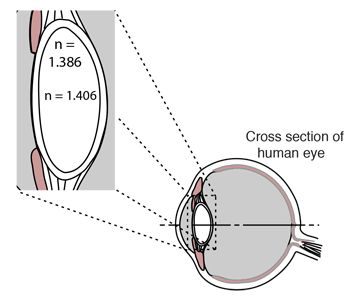 The index of refraction of the cornea is about 1.376. Rays pass from the cornea into the watery fluid known as the aqueous humor which has an index of refraction of about 1.336, so most of the refraction is at the cornea-air interface. 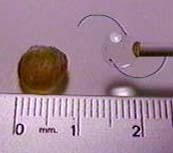 About 9mm in diameter and 4 mm thick, the crystalline lens provides perhaps 20% of the refracting power of the eye. Hecht likens it to a tiny transparent onion with some 22,000 fine layers. The index ranges from about 1.406 at the center to about 1.386 in outer layers, making it a gradient index lens. It is pliable, and changes shape to accomplish accommodation for close focusing. The term cataract is used to describe the condition of clouding or darkening of this lens. 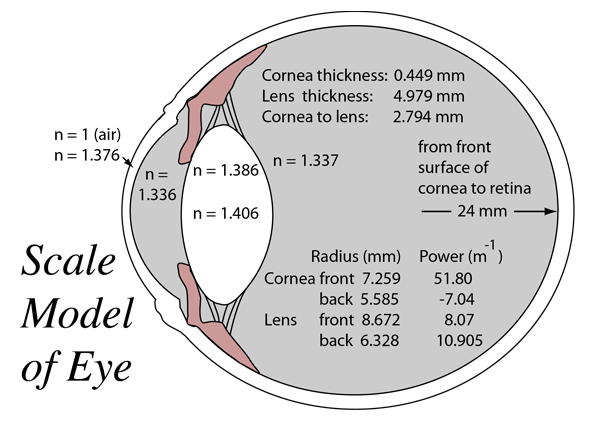 The anterior chamber of the eye is filled with the watery "aqueous humor" which has an index of refraction of about 1.336. It is positioned immediately behind the cornea. 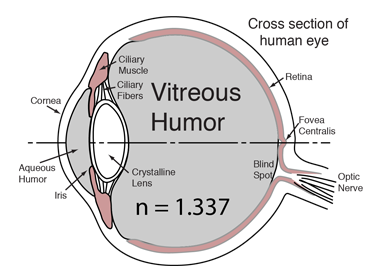 The larger chamber of the eye is filled with the gelatinous "vitreous humor", which has an index of refraction of about 1.337 . 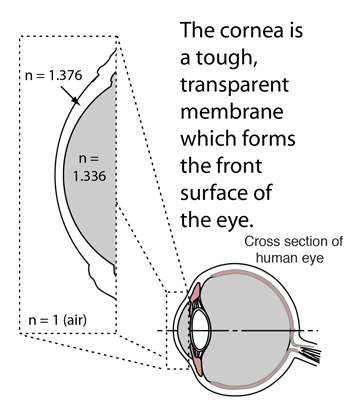 The large chamber of the eye is filled with the gelatinous "vitreous humor", which has an index of refraction of about 1.337 . 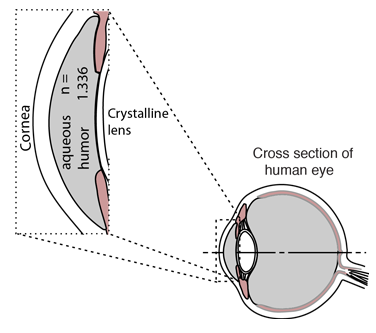 The front chamber of the eye, immediately behind the cornea, is filled with the watery "aqueous humor" which has an index of refraction of about 1.336. The index of refraction of both of the interior fluids of the eye are very close to that of water, n= 4/3 = 1.333 . Cataract example courtesy of Dr. J. A. Ayres, M.D. When the inner lens of the eye becomes darkened or opaque, the condition is called a cataract. The lens may be surgically replaced with a plastic lens. This can have dramatic results in restoring vision to the eye. The implanted lens is of fixed focal length, so it is not capable of accommodation like the natural lens. This is usually not a major concern, because persons who develop cataracts after age 60 do not have much accommodation remaining anyway because the inner lens has become less pliable with age.